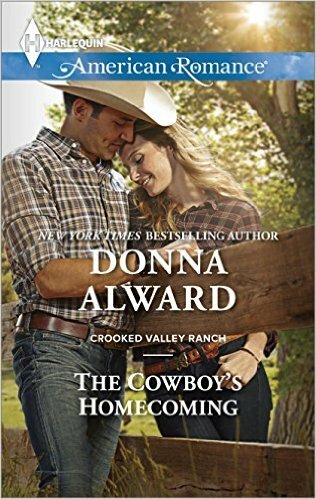 The Cowboy’s Homecoming, by Donna Alward, is a 2015 book. Yes, for a change I’m reviewing a current release. This a Harlequin American Romance, which means a small town or western setting, and relatively ordinary folks. It is a line I enjoy, and an author I have come to appreciate, so my expectations were high. I was not disappointed. Ryan works the rodeo circuit, and lives in his trailer, but agrees to make the ranch his home base for a while. Childhood events have left him reluctant to settle down anywhere or make any commitments. A combination of thrifty living and rodeo wins mean he is financially comfortable, and he occasionally enjoys female company. Ryan last visited the ranch a few months ago, and at the local Valentine’s Day dance he spent a lot of time with Kailey, from the next ranch over. Kailey lives and works on her parents’ ranch, and Alward acknowledges the challenges she faces working in what is still seen as a man’s world. Part of that includes being discreet about her occasional enjoyment of male company, because of double standards about sexual behaviour. She’s dedicated to the ranch, and her last relationship ended when her boyfriend assumed she’d leave the ranch to be his wife. Single at the local Valentine’s Day dance, she’s quite happy to spend time with drifter Ryan, partly to demonstrate to herself and others that she’s completely over the breakup. When the morning comes, and Ryan realizes his connection with Kailey might be more than passing, he can’t get out of the motel fast enough. She wakes alone, and stuck with the bill, which makes a discreet departure impossible. When Ryan returns a few months later, things are awkward. The basic plot is a one night stand between acquaintances that leads to relationship. Proximity helps. They are neighbours, with a narratively convenient swimming hole between the properties, and become business partners in horse breeding (ahem). The obstacles revolve around trust issues. When the couple eventually end up sharing a motel room again, we know what’s going to happen. However, the real climax is not the misunderstanding, but how the characters react and process their feeling about the misunderstanding. Ryan and Kailey are both hard working, smart, and strong independent characters. Both are interested in a relationship, but both have concerns and doubts. It’s a pleasure to watch them work to overcome that, grow, and change, especially in the fecund atmosphere of a farm and newly married couples. I’m also pleased that no one had to sacrifice anything for the relationship. Kailey eventually realizes that she would leave the farm for Ryan, because he’s a man that would never ask her to do that. Romance stories show us love conquering all, and while we know it’s a fantasy, the more realistic ones keep us hopeful. Ones like this and the others in the Crooked Valley Ranch series also give us the fantasy of a stable home and loving extended families. Alward doesn’t shy away from reality. In this series we have layoffs, divorce, infertility, returning wounded veterans, sexism, early loss of a spouse, and early loss of a parent. Despite this, people are able to lead happy lives, though being in a couple seems to be important. My inner cynic would love to see a siblings series where one of the siblings is happily single, or in non-traditional relationship of some sort. However, I enjoy the dual fantasies of a healthy loving couple and a strong extended family. If we can imagine them, we can make them happen. I’m grateful to Alward for presenting the possibilities.